The Colony of Aden or Aden Colony (Arabic: مستعمرة عدن‎ Musta‘marat ‘Adan) was a British Crown colony from 1937 to 1963 located in the south of contemporary Yemen. It consisted of the port of Aden and its immediate surroundings (an area of 192 km2 (74 sq mi)). Prior to 1937, Aden had been governed as part of British India (originally as the Aden Settlement subordinate to the Bombay Presidency, and then as a Chief Commissioner's province). Under the Government of India Act 1935 the territory was detached from British India and established as a separate colony of the United Kingdom; this separation took effect on 1 April 1937. On 18 January 1963, the colony was reconstituted as the State of Aden (Arabic: ولاية عدن‎ Wilāyat ʿAdan) within the new Federation of South Arabia. The federation in turn became the People's Republic of South Yemen on 30 November 1967, marking the end of British rule. Prior to 1937, Aden had been governed as part of British India (originally as the Aden Settlement under the Bombay Presidency, and then as a Chief Commissioner's province). Under the Government of India Act 1935 the territory was detached from British India, and was re-organised as a separate Crown Colony of the United Kingdom; this separation took effect on 1 April 1937. After 1937, the economy of Aden continued to be largely dependent on the city's role as an entrepôt for East-West trade. During the course of 1955, 5239 vessels called at Aden, making its harbour the second busiest in the world after New York. However, tourism declined over the last years of the Colony with the number of tourists landing dropping by 37% from 204,000 in 1952 to 128,420 in 1966. At the end of British rule in 1967, the main revenues of the Colony were the Port Trust with an annual gross revenue of £1.75 million (2014 prices: £28.4 million) and the British Petroleum refinery which made direct payments to the Aden Government of £1.135 million (2014 prices: £18.4 million). The British Army returned to Aden in July 1955 after Yemeni-armed rebel tribesmen caused disturbances. Minor events continued into early 1956 when a British assistant adviser to part of the Western Aden Protectorate was wounded in a rebel ambush. On the 19 March 1956, labourers at the Little Aden refinery went on strike. Workers stoned policemen at the refinery gates, with clashes resulting in some deaths. The strike lasted ten days, being called off on the 29 March, with agreement reached mainly on pay. The strikes in 1956 were marked by a good many attacks on non-Arab groups. It was during this time that the Army took over command of Aden from the Royal Air Force, with its presence maintained "in view of the importance of preserving internal security" according to War Secretary Antony Head. Days after the strike had ended, the Governor Sir Tom Hickinbotham conferred with almost all of the tribal leaders from the Aden Protectorates, where broad agreement was reached that they should "seek some form of close association with each other". In May 1958 a state of emergency was declared and there were a number of bombings until the arrest of the principal instigators in July. However, in October 1958 there was a general strike, which was accompanied by widespread rioting and disorder which ended in the deportation of 240 Yemenis from Aden, as claimed by author Gillian King: "By ignoring the views of the local labour force, the British pushed much of the Arab population into opposition against their rule, who previously had been by no means captivated by Nasser". At the time much of the blame for these disturbances was placed on the broadcasts from Radio Cairo encouraged by Nasser's anti-imperialist and Arab Nationalist regime there, as claimed by author R. J. Gavin: "Radio Cairo began to speak in the tones of revolutionary Arab Nationalism. Men who had long lived in isolation now found a common political language and a breathtaking, liberating community of sentiment across the Arab world". The 1948 Arab–Israeli War made immigration into Israel very difficult, as the Red Sea and Suez Canal were closed by the Egyptian government. By 1949 and after the declaration of a cease fire, 12,000 Jews from Yemen, Aden and the Protectorate were gathered in camps, from where they were airlifted on average 300 a day to Israel, in Operation Magic Carpet. On 18 January 1963, the colony was reconstituted as the State of Aden (Arabic: ولاية عدن Wilāyat ʿAdan), within the new Federation of South Arabia. With this Sir Charles Hepburn Johnston stepped down as the last Governor of Aden. Many of the problems that Aden had suffered in its time as a colony did not improve on federation. 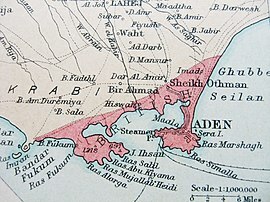 Internal disturbances continued and intensified, leading to the Aden Emergency and the final departure of British troops. British rule ended on 30 November 1967. The federation became the People's Republic of South Yemen, and in line with other formerly British Arab territories in the Middle East, it did not join the Commonwealth of Nations. ^ "Port of Aden from the Sea". World Digital Library. December 1894. Retrieved 11 June 2013. ^ H. J. Liebensy. Administration and Legal Development in Arabia. Middle East Journal 9. 1955. p. 385. ^ H. J. Liebensy. "Administration and Legal Development in Arabia", Middle East Journal (1955), p. 385. ^ a b E. H. Rawlings. The Importance of Aden. Contemporary Review 195. 1959. p. 241. ^ Colonial Office List, 1958 (London, HMSO, 1958), cited in Spencer Mawby, British Policy in Aden and the Protectorates, 1955–1967, Last Outpost of a Middle East Empire, London, Routledge, 2005, p. 14. ^ Colonial Reports. Aden Report 1953&54. HM Stationery Office 1956. ^ D. C. Watt. Labour relations and Trade Unionism in Aden 1952–60. ^ R. J. Gavin. Aden Under British Rule. p.323. ^ E. H. Rawlings, Contemporary review 195. 1955. p.241. ^ Spencer Mawby. British Policy in Aden and the Protectorates 1955–67: Last Outpost of a Middle East Empire. ^ Elizebeth Monroe. Kuwayt and Aden.p. 73. ^ R. J. Gavin. Aden Under British Rule. p.325. ^ Elizabeth Monroe. Kuwayt and Aden. p. 70. Schaefer, Charles (1999). ""Selling at a Wash:" Competition and the Indian Merchant Community in Aden Crown Colony". Comparative Studies of South Asia, Africa and the Middle East. 19 (2): 16–23. doi:10.1215/1089201X-19-2-16.